Despite 40 years of bringing in prairie chickens from other states, Missouri has failed to raise the birds' numbers due to diminishing grasslands. Even though Missouri conservation officials have shipped in hundreds of prairie chickens over the last 40 years, the native species has steadily declined in the state. As the Missouri Department of Conservation prepares to count prairie chickens this spring, the agency reported this week that the population in Missouri has dropped to fewer than 100. In the 1800s, there were hundreds of thousands of prairie chickens that roamed throughout the state. The birds that remain can only be found in small patches of prairie in western Missouri. 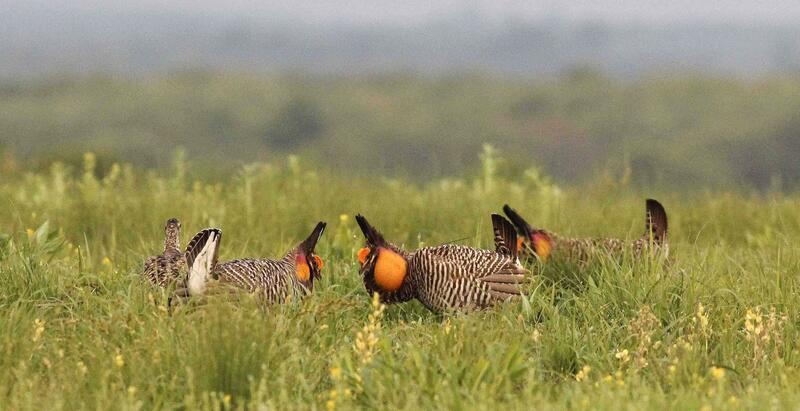 The MDC has tried to bring in prairie chickens from Nebraska and Kansas, where the species is not endangered. The department is also working with farmers and ranchers to restore prairies. But neither effort have brought about long-term increases to the birds’ population, said Max Alleger, a grasslands biologist at the MDC. Over many decades, the grasslands the prairie chickens depend on have shrunk to less than a percent of the area they once covered in Missouri. Part of the problem, Alleger said, is that Missouri’s climate has become wetter than neighboring states. That has partly caused forests to encroach on grasslands, and in turn, contributed to drop in the birds’ numbers. The prairie chicken was added to the state’s endangered species list in 1999. “The fact that we’ve got very small islands of good grassland habitat remaining in the state has been the main situation driving the decline of the greater prairie chicken,” Alleger said. Prairie chickens are members of the grouse family and have distinctive orange pouches on their throats, which play a role in their mating rituals. To get females attention, males stomp their feet, fan their feathers and puff out the pouches, which creates a booming noise that can be heard a mile away. One way the state agency is trying to improve habitat for prairie chickens is by encouraging ranchers and farmers to allow cattle to graze in grasslands. Before human settlement, bison and elk would graze in prairies, and as the grasses grow back, the new plants would promote a variety of wildflowers and plants that benefit the prairie chickens. There are less than a hundred prairie chickens in the state that live mainly in small patches of prairie in western Missouri. The MDC regularly monitors the prairie chickens in early spring at the Taberville Prairie Conservation Area in St. Clair County and the Wah'Kon-Tah Prairie in Cedar County. The agency does not plan to relocate any prairie chickens from western states, as MDC did previously from Nebraska and Kansas, until there is enough habitat in Missouri to sustain them. The prairie chickens play an important part of the food web in grassland environments and help control populations of insects they eat. It’s also not the only grassland species that’s declining, said Alleger.